Cooper Hewitt has a full set of the Loves of Psyche scenic wallpaper first produced in 1816. The museum’s edition was printed in the early twentieth century using the original woodblocks. This scenic paper is unique on two fronts: it is the only scenic not designed to be continuous, and it is the only scenic set almost entirely indoors. The story of Cupid and Psyche dates back to the second century AD and the nutshell version as illustrated in the wallpaper, is Psyche’s mortal beauty causes Venus to be jealous; Psyche and Cupid fall in love; Cupid flees Psyche; Psyche becomes desperate and turns to Venus; Venus then asks Psyche to complete a series of tasks before she can be reunited with Cupid. That’s a lot of drama! The museum’s set of Cupid and Psyche had been previously installed and being from the 1920s it was printed on acidic paper, and wasn’t so carefully removed from the walls, so it had some damage. The museum has since been able to conserve one scene which shows the Reconciliation of Venus and Psyche. 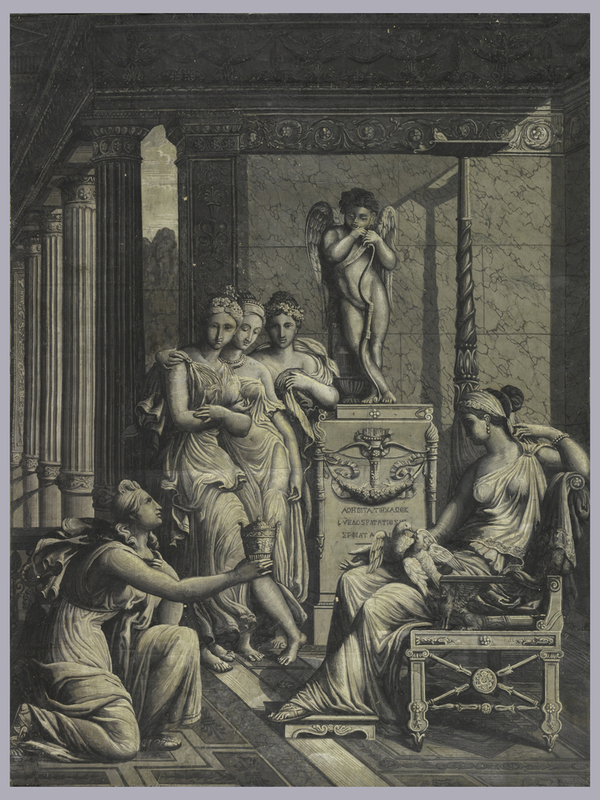 In 2013 the museum was given another scene from this scenic paper which shows Psyche offering Venus a goblet of water from the fountain of youth, which is today’s Object of the Day. This is an early printing on joined sheets of handmade paper showing a kneeling Psyche offering the goblet to Venus. This was one of the last feats Psyche was asked to perform. Upon its completion Psyche was made a Goddess, allowed to marry Cupid, and lived happily ever after. In 1996, the museum was able to acquire at auction two of the original drawings for this scenic wallpaper. One of the drawings is the Reconciliation of Venus and Psyche, while the other is Psyche offering Venus a goblet of water from the fountain of youth. Talk about coincidence! These drawings are quite small and were used to create full-scale cartoons, which were then traced on the woodblocks and carved. When printed the design is reversed.